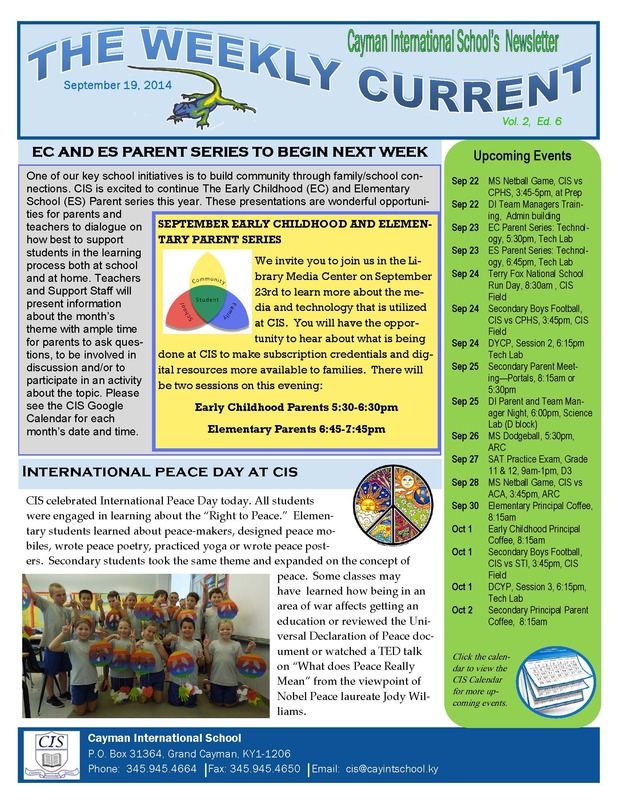 The CIS weekly newsletter provides parents, staff, and students with important information. CIS shares additional highlights and student recognition on our social media sites. Thank you for sharing in our community. Click below for our latest issue. Our seventh graders spent the week of April 1st exploring the marine environments of Little Cayman. On Friday, March 22nd, World Water Day, CIS held its second annual Walk for Water event for South Sudan. Last week, CIS welcomed best-selling and award-winning author Linda Sue Park to our campus. The CIS Robotics Team has returned from the FIRST (For Inspiration and Recognition of Science and Technology) Tech Challenge Jamaica National Championship laden with awards and accolades. On Wednesday, March 13th, Grade 11 and Grade 2 students visited some of our mangroves right here in Camana Bay as part of their learning and service project. A dedicated group of three Cayman International Students will be foregoing part of their March break to attend the Jamaican National FIRST Tech Challenge Robotics competition from March 7th to March 10th at Jamaica College in Kingston, Jamaica. This past Wednesday CIS hosted the Inaugural Cayman Islands Interschool Chess Tournament in the ARC. On Wednesday, February 13th, 25 CIS high school students participated in CAY-MUN IV, the island's annual inter-school Model UN conference organized by CIS. Our Staff Spotlight is back and features Elementary Art teacher, Ms. Jess Mittelman. Ms. Jess is a leader in our sustainability initiative on campus and also a featured artist in Kaaboo this weekend. Click here to read more about what inspires her and the one lesson she would impart to her students. This Wednesday, our Grade 2 and Grade 11 students got together to share their learning about mangroves in the Cayman Islands and the wider world. In line with CIS's sustainability principle, Grade 11 has launched a mangrove education and restoration project, The Grove Zone, and is hoping to work with various local organizations as well as other members of the CIS community. Our Model UN team headed off to Chicago to participate in the Chicago International Model UN Conference for their seventh consecutive year. On Wednesday CIS hosted the third annual Scrabble Scrum Tournament in the ARC. There were nine teams representing their three schools with enthusiasm and determination. Our High School swim class completed their PADI Skin Diver Course this past month which included an open water snorkel at Eden Rock. The expansion of Cayman International School is an exciting project that will enhance the educational experience for students, increase the capacity of the school to nearly 1100, and will maintain the small class sizes and positive culture that CIS is known for. Read more about CIS is expanding! Three CIS students from the Cayman Islands Sailing Club competed at the Bahamas Opti National Championships (including 86 sailors from Bahamas, Turks and Caicos and the US) last month and sailed through the picture perfect regatta conditions to incredible results. Over the summer, eleventh-grader, Joe Allom-Perez and two other local students participated in FIRST Global Challenge 2018, a robotics competition held in Mexico City. Last Friday, CIS hosted the 2nd annual EduCanada University Fair where nine universities from Canada connected with students from all over Cayman. The ARC and classrooms around CIS were brimming with energy as students debated the assertion: Be it resolved that after meeting their basic needs, individuals have a moral responsibility to donate their wealth towards poverty alleviation. Our visiting consultant, Ken O’Connor, kindly agreed to record a podcast for our parents, in which he responds to frequently asked questions about progressive grading practices, including standards-based grading. This month's Staff Spotlight features Secondary Instructional Coaches Chad Van Cleve and Chad McGartlin. Be sure to read on to learn about what inspired them to get into education and what advice would you give to parents on how to support their students with their sustainability initiatives. Our September Staff Spotlight features new teaching couple, Mike and Carol Neeland, who join us this year from The American School of the Hague. Their 30 years of teaching have taken them around the world. Click to read more about their favorite trips and what lessons they hope to impart to their students. Over 120 volunteers, including students, parents, teachers and community members collectively woke up before sunrise to drive out to Eagle Rays this past Sunday in an effort to remove the extensive waste scattered across a previously pristine beach. Staff Spotlights are back and this month we are featuring our new Elementary Assistant Principal, Ms. Leanne Wright-Gray. Click here to read about who inspired her to get into education and what advice she would give to people just moving to Cayman. Welcome to the 2018/19 school year! CIS opened its doors this week to approximately 650 students from more than 30 countries, and our bright, beautiful campus is finally alive again! George H., Matheo C., and Jaspar N. have had a full summer sailing in Europe. They competed in the 2018 Volvo Gill British Optimist Nationals held in North Wales, UK. A number of Cayman International School student athletes are currently representing the Cayman Islands in the CONCACAF Under-15 Girls' Championships in Bradenton, Florida. For our last Staff Spotlight of the year, we chose to feature Ms. Nimmi who will soon retire. Click here to read about what inspired her to get into education, her plans for retirement and what she will miss most about Cayman International School. Last week, many of our high school students chose to participate in the CIS Service Trip to Costa Rica. We are excited to introduce the new faculty and staff members who will join the CIS family for the 2018-19 school year. Read more about Welcome New Faculty and Staff! The first ever Youth Sailing Week (YSW) ended with a bang over the long weekend at the Cayman Islands Sailing Club (CISC). Grade 11 students visited both the Wastewater Treatment Plant and the Georgetown Landfill as they investigated current consumption trends of Grand Cayman. National Honor Society students partnered with Ms. Mary, Ms. Darcy and Ms. Monica’s grade 5 classes to help Life.org clean, sticker, sort, and log hundreds of books for local public libraries on island. Matheo C., George H. and Jaspar N., all sailors at the Cayman Islands Sailing Club, returned home Tuesday from representing the Cayman Islands in Optimist Sailing Regattas in Europe. This month's Staff Spotlight features teaching couple, Stephen and Pam. They recently celebrated their 40th wedding anniversary! Read on to find out their secret. Our seventh graders spent the week exploring the incredible marine environments of Little Cayman. CIS recently participated in the Annual Minds Inspired Mathematics Competition sponsored by DART. Cayman International School recently sent two teams to participate in the KPMG Football Fest tournament hosted by Lyford Cay International School. On Wednesday this week, CIS hosted the third annual inter-school Model UN conference. Our first Staff Spotlight features Mr. Brandon and Ms. Kristine who joined us this year from Hanoi, Vietnam. Read on to find out what is on their Cayman bucket list and the important lessons they hope to instill in their students. On Wednesday, February 7th, the CIS community came together for our annual International Night celebration. Last week CIS hosted the 4th Annual Destination Imagination Tournament in the ARC. Six sailors from the Cayman Islands Sailing Club represented the Cayman Islands at the 76th Annual Boomerang Regatta at the Lauderdale Yacht club over the weekend. The Second Annual Cayman Chess Tournament was held on Saturday, January 27 at the George Town Public Library. On Wednesday, Jan 10th, CIS held its first ever ‘PLE Showcase’. PLE (Personalised Learning Elective) is a new course at CIS, which focuses on allowing students to pursue their passions by learning a new skill or tackling a problem that they care about. CIS gymnasts representing Motions Unlimited continued their competitive season at the 2017 Gymstrada Invitational in Virginia Beach, Virginia December 2nd, and 3rd. Way to go Middle School/HS Water Polo League! We had our inaugural water polo league this past Wednesday at CIS between our current MS & HS swimmers. CIS sent 6 teams to the Primary TAG Rugby tournament held at the Rugby Club on Tuesday. This was the first time we have entered the event, and the students had a blast! This week grade 11 and 12 students returned from Chicago where they participated in the 14th Annual Chicago International Model United Nations (CIMUN). CIS U14 Girls Win Championship! On Wednesday, November 22, the CIS U14 Girls defeated Cayman Prep 2-1 in the inaugural Dart Under 14 Cayman Islands Football League. Read more about CIS U14 Girls Win Championship!